A few weeks ago I shared my bathroom makeover that was almost completed. I just needed to add some trim and frame out the mirror. 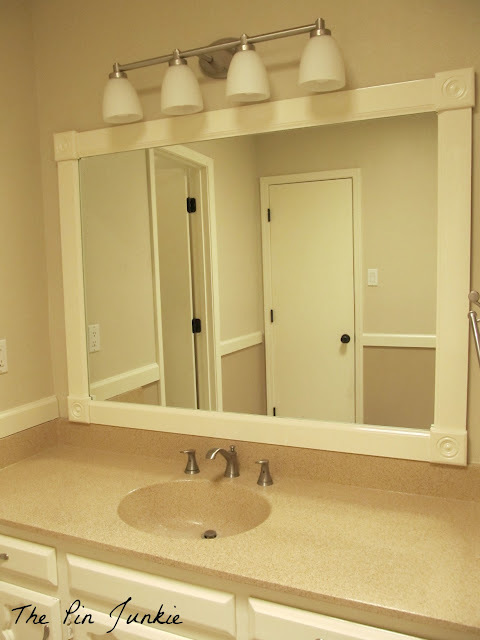 Can you believe that framing the mirror is actually what started the bathroom makeover in the first place? This project started a year ago so it feels really good to have it finally finished and crossed off my to-do list! This project required me to use tools as well as measure and cut accurately which are not my strengths. I was able to measure and cut the trim with no problem, but I just could NOT get the mitered 45 degree cuts to join up accurately in the corners. 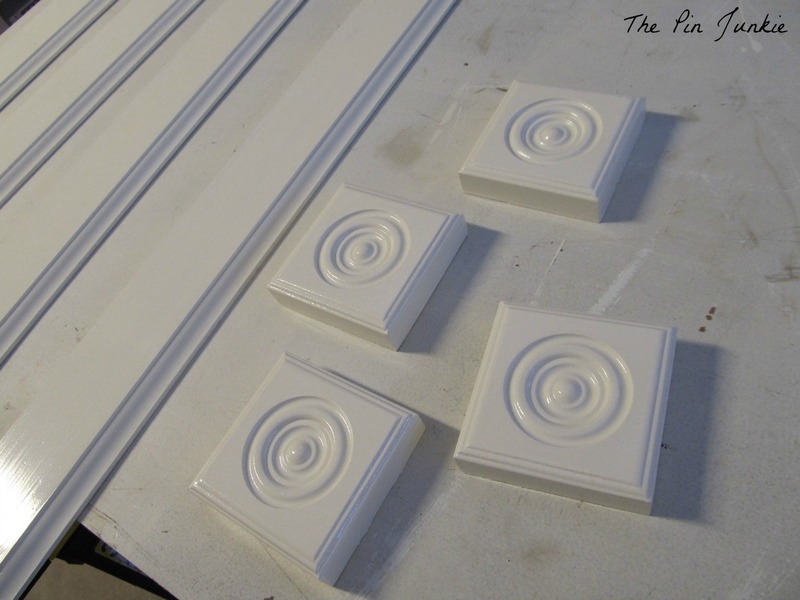 By the time I had cut several pieces of trim, I'd made a rather large investment in moulding. It probably would have been less expensive to just buy a large framed mirror to replace the existing one. Finally, I just decided to make 90 degree cuts on the moulding and add decortive squares in the corners and it was a great fix to the problem. I wish I'd done that in the first place and saved myself some time, money, and a whole lot of frustration. 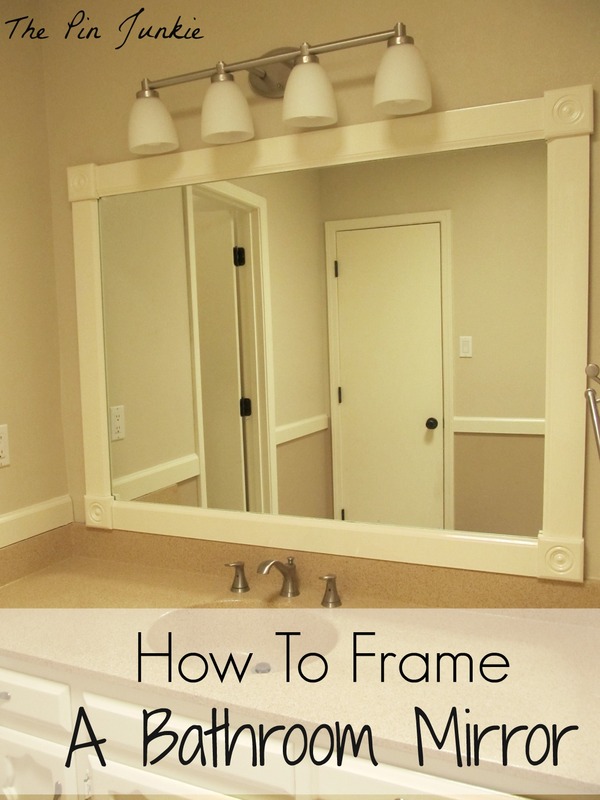 If unlike me, you know what you're doing, and can do it right the first time, then this is a really inexpensive way to add a custom frame to a plain mirror. Before I share with you what I did, please note that there are many tutorials on the internet on how to do this and they may give you more information. I have several of them pinned to my For the home - bathroom Pinterest board. I measured the mirror and cut the pieces of moulding to the sizes I needed. I painted the back of the moulding so the unfinished part wouldn't show in the mirror. I didn't paint the entire back side because the glue said it wouldn't adhere to painted surfaces. I just painted the edge that would reflect in the mirror. When the paint was dry on the back, I flipped the pieces over and painted the front of the trim before I glued it onto the mirror. You could paint the trim after the pieces are glued to the mirror. I just didn't want to line everything with painter's tape. See those little decorative squares? They really were a life saver for this project. If you're not handy at work working, I recommend getting these. They make the whole project a lot easier! I used this adhesive. It's specially made for mirrors. 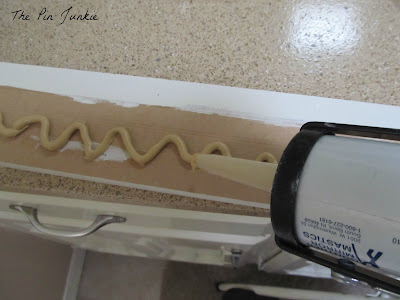 Be sure that you're ready to go before you start gluing because the adhesive sets up quickly. 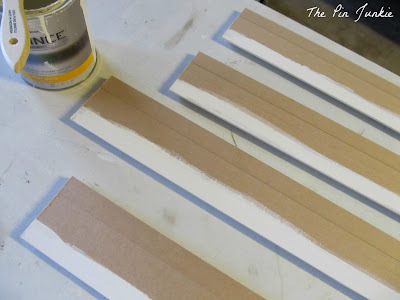 Make sure the trim pieces fit correctly and you have what you need before you begin gluing. Apply the glue to the back of the trim. Use a good amount so that it will really stick to the mirror, but be careful not to use so much that is squishes over the edge. You don't want to see the glue in the mirror. Then just glue the trim onto the mirror. I held it in place for about a minute while the glue was setting. You can use painter's tape to hold it in place, but I didn't need to because the glue set up really quickly. I solved the 45 degree angles not matching up by cutting the trim pieces at 90 degrees and using these decorative squares in the corners. I think it turned out really nicely and certainly customizes an otherwise plain mirror. Now that I know how to add a frame to a mirror, I think I'll do this for the large mirror in my master bathroom. Knowing me, that will probably lead to redoing the whole bathroom! There have been a lot of questions about the little clips that hold the mirror to the wall. Yes, I did have those on my mirror and they were in the way. I removed the screws and clips and took the mirror down from the wall. I needed an extra person to help because the mirror is big and heavy! I used the same mirror mastic that I mentioned above to adhere the mirror to the wall. I wasn't sure it would hold, but it did and that mirror isn't coming off any time soon! The mirror mastic is strong stuff and 100% permanent (meaning if you want to change things later, it will be difficult.) Once the mirror was up with mirror mastic, I didn't need the mirror clips and could glue on the trim. Looks lovely! I've never seen it framed with those corner pieces! It adds so much character!You did an awesome job! Thanks for the invitation Laurie! I linked up. Great tutorial on this. I have a mirror that needs framing, too, and didn't know about not painting the entire back of the trim. Great tip! Pinning for reference when I get to this project...long project to-do list! Your mirror frame looks awesome! You make this look so easy... I hope to try as I can't stand our big plain mirrors! It looks so good! Mine looks very similar that I did a few months ago! Makes such a difference! Nice job! Love it. Really frames gives fabulous look to bathroom mirrors. Love this idea so much! Pinned it to my "Bathroom ideas" board for whenever we finally (!) 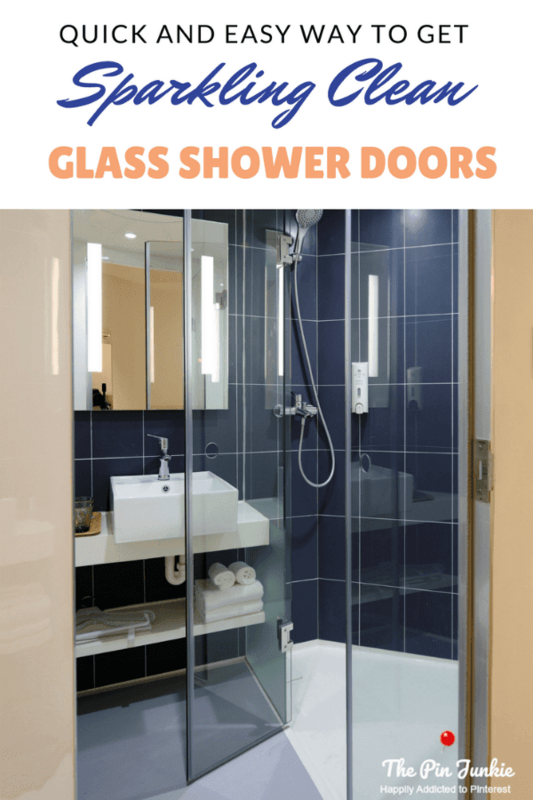 figure out how and what we want to do to our builders-grade bathrooms! Nice work...I'm in the midst of a similar project...great to see your how to! Found you at the huckleberry love linky party. i seriously can't wait to do this in all my bathrooms! Looks great, and I've been wanting to do this in our master bath for so long. Question: was your mirror glued to the wall or did it have those little (sticking out) plastic pieces that held it to the wall? Thanks for sharing, saw another link of yours at The Dedicated House which led me to this post. The mirror did have the clips holding it to the wall. We removed the clips and took the mirror down from the wall when we painted. When we put the mirror back, we used mirror mastic to glue the mirror to the wall. It was the same mirror mastic that we used to glue the trim to the mirror. It is strong stuff and it will probably never come off! 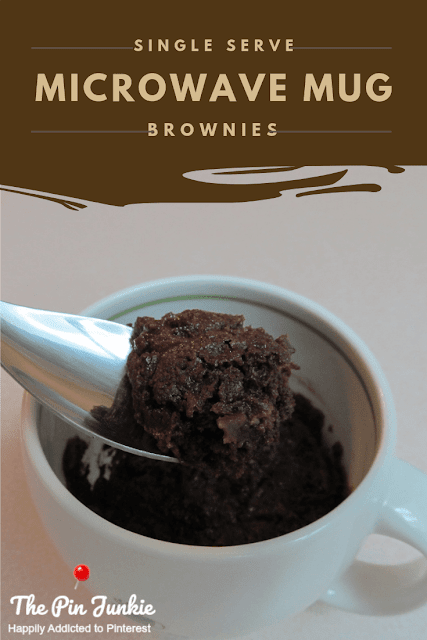 This is super cute and so easy! Thanks for sharing. I'd like to invite you to our Organize Me! 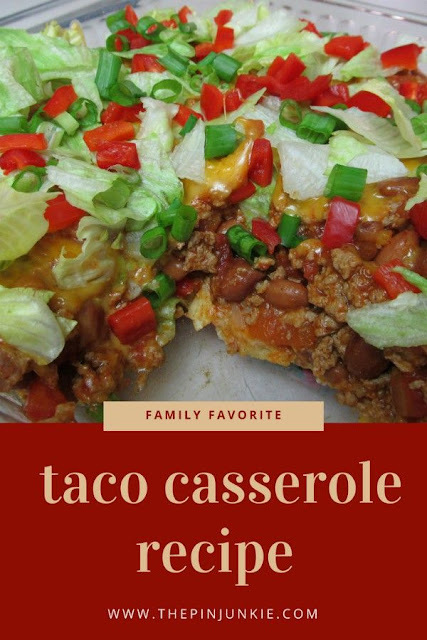 Sizzlin' Summer Link Up Party at Get Your Crap Together! Thanks for the invitation Chelsea! The decorative squares look fabulous! Those really create interest. Thanks for sharing on our BeBetsy Brag About It party! This looks really nice! We're currently doing master bath remodel and kept our builder grade mirror. I'll keep your suggestions in mind. Thanks for the idea! 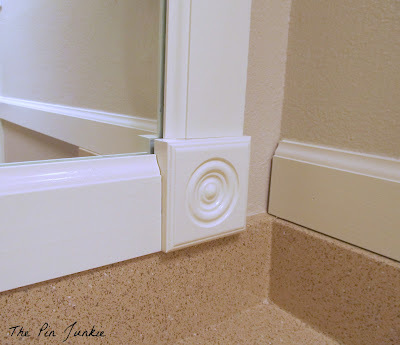 What a great idea.. love the decorative corners! your frame looks so much better than the ones you buy. My house came with one and I wish so much they hadn't put it in. I like yours so much better! Thanks for inviting me to your party! I linked up! 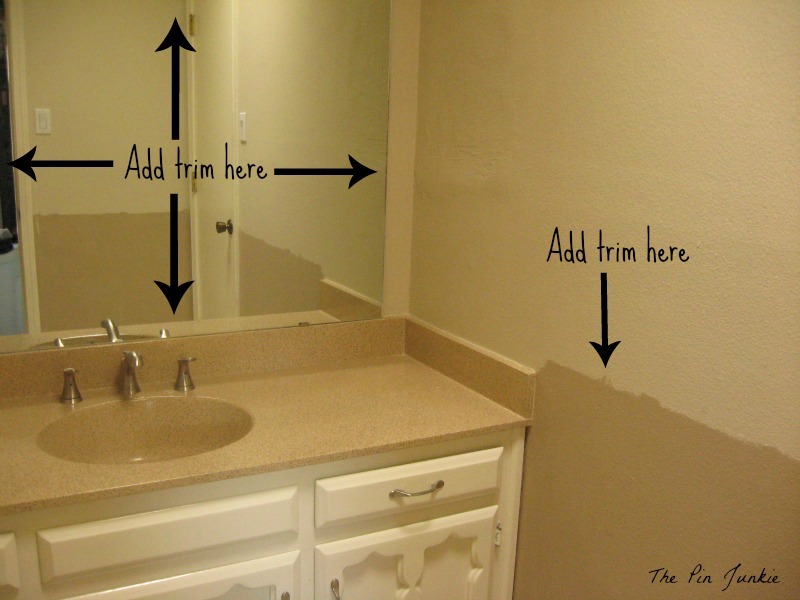 I have been thinking about framing out my bathroom mirror and I'm glad I found this blog. I was actually worried if I could get the edges mitered correctly. This is a great fix! Thanks for sharing your journey! I love it! Pinned it for later! Thanks for sharing at All Our Days! It looks great! I love how you used the rosettes to finish the corners. It sure beats using the miter saw. I'm pinning this! Ever since I framed my mirror my neighbor wants to do hers. I think I'll show this to her. This is a popular DIY project. My sister-in-law did the mirrors in both of her bathrooms and they look great. I just love framed mirrors in the bathroom. I've been begging my hubs to frame our powder room mirror- I will have to show him your post! Great tutorial. I always wanted to know how to do that. This is such an awesome post. I would love it if you would share this post at our WIW linky party. Hope you can join us! I think I could do this. Great instructions and pictures. Thanks for linking to What'd You Do This Weekend? You did a great job! What a pretty update! 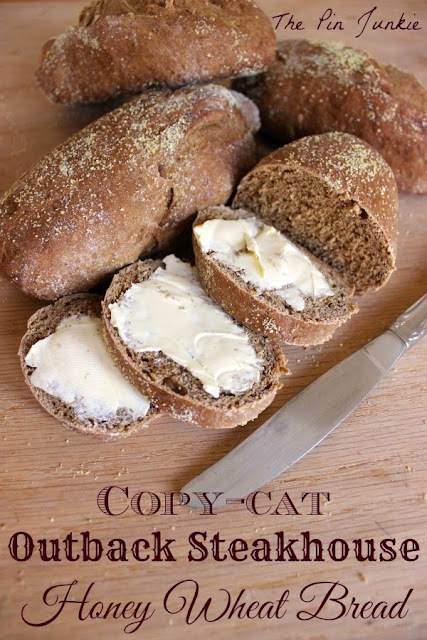 I did this too and it's my all-time most popular post! It's a popular project right now. My sister-in-law did the mirrors in both of her bathrooms and it looks really good. She was able to do the mitered corners though! Great job! I always leave the mitering to my hubby. He does a pretty good job. Thanks for sharing with SYC. Thanks so much for the feature Andrea! I appreciate it! Did you have the little plastic screw doo-hickies on the front of the mirror? Mine all have that and I am not confident in my ability to cut around them very well. Yes, I had the plastic clips that held the mirror in place. I unscrewed the clips and removed the mirror from the wall when I removed the wallpaper and painted. 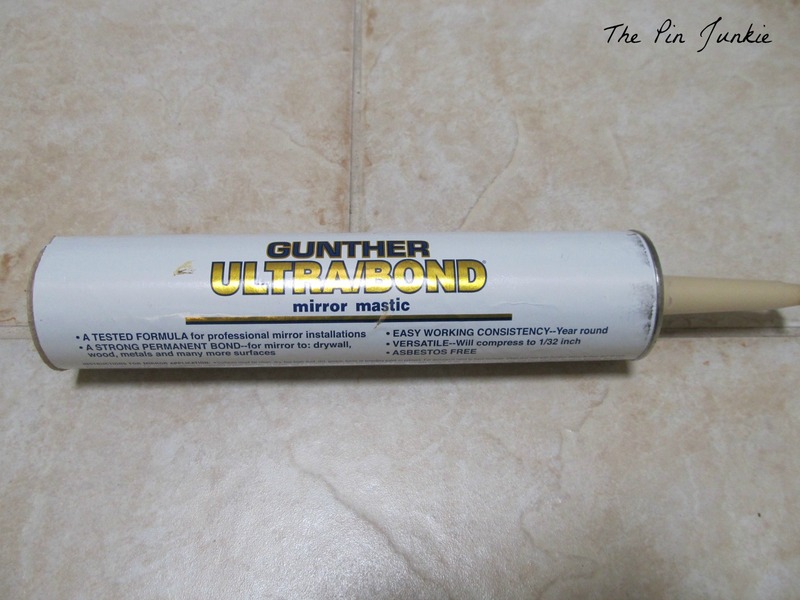 When I replaced the mirror I used mirror mastic, a glue specially made for mirrors, and just glued the mirror to the wall. I didn't need to use the clips, but I will never be able to move the mirror again. That glue is permanent! Then I glued the frame onto the mirror without worrying about the plastic clips getting in the way. Bathroom mirror frames do make a big difference. They make the bathroom look more inviting. I also think that they draw more attention to the mirror. As a result, the room appears bigger. A frame like that inspires other ideas. For example, you could use a stencil to put something interesting at each corner, or find a beautiful dye and change the color if you get bored with the shade. Now, I can finally makeover my two mirrors thanks to your great instructions. I never tried it before because I thought the only way to do the molding was by nailing it into the wall. Thanks for sharing, pinned. My husband is thinking in doing the frame for our bathroom , yours look so beautiful I want ours Dark color . thanks for the Idea. A dark color would look really nice. My sister-in-law framed her bathroom mirror and painted it dark, espresso brown along with the bathroom cabinets. It looks really good! I just bought very similar pieces from Home Depot yesterday. Same looking vanity, sink top and lights! I wanted a mirror in between, not a medicine cabinet. Where did you get your flat mirror? Also, what was the color of paints you used for wall/trim? I LOVE IT! Would love to do the same. Thanks for sharing!!!! I didn't have to buy a new mirror - I just used what was already in the bathroom. The paint color I used is a custom color made to match the existing trim and cabinets that were already in the bathroom. Lucky you!!! I've been thinking about it ever since. Already went to Target... no mirror like that. I have some time to look around. You did an awesome job!!! I really like your update. I was wondering if you had those little plastic nubs "holding up" your mirror. I have them and I am worried that they will throw off the whole plan. I will want to do this update but with those in the way I'm not sure it will ever happen. I did have the plastic pieces and they were in the way. After removing the mirror, I unscrewed the plastic pieces from the wall. Then I used mirror mastic, which is a type of adhesive just for mirrors to stick the mirror back on the wall without the plastic pieces. The mirror is very large and heavy and I wasn't sure the adhesive would be strong enough to hold. Mirror mastic works exceptional well, it's practically permanent. I also used this method in framing a doorway. Manufactured homes have the very thin and flimsy strips around the doorways. I didn't want to even try to miter 45 degree corners. so I used the square corners and some stained 1x4s to go around the door frame. Love it! Quick question, did your mirror have those little nails in the clear piece that helps keep it attached to the wall? We have those and we aren't sure if we can glue trim around the mirror. Yes, it did. I removed the screws and the clips and took the whole mirror down from the wall. 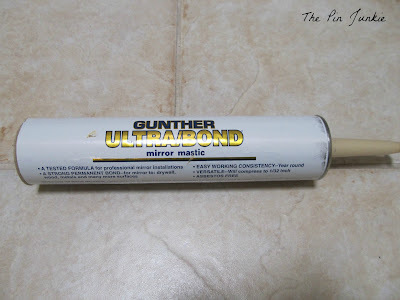 I applied mirror mastic (a special adhesive for mirrors) on the back of the mirror to hang it on the wall without the screws and hanging hardware. Once the mirror was back on the wall without the screws and mirror clips, I was able to attach the frame. 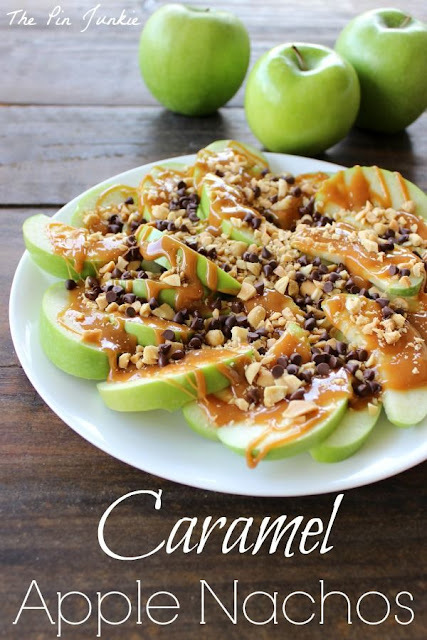 This looks fantastic! I'm doing a bathroom reno now and can't find a mirror big enough, plus my existing and very old builder grade mirror seems to be glued on, so I was thinking of framing it like this. I'm wondering what you did with the visible edges of mirror on the outside... Did you leave them exposed? Paint them?